Having put off learning to drive until I was 23, I was extremely anxious about getting behind the wheel and finally trying to get my licence. I got in touch with Fiona and she went out of her way to fit in as many lessons as she could as I only had a short period to pass before leaving the country. Fiona was very friendly and relaxed which helped me very quickly to get over my fear of driving. Rather than telling me what I did wrong, she let me figure this out myself (with a little bit of a push in the right direction!) This helped me learn much quicker not to make the same mistakes again e.g. “How might you do that differently?” rather than “You should have done...” Having to be self-critical made the learning process much faster and Fiona's calm, relaxed attitude helped turn driving from something I was afraid of into something I now enjoy. All of my lessons were thought-out and structured so as to maximise the time spent learning the things I felt least comfortable with and never did I feel that any time was being wasted. 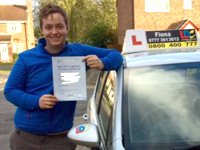 I cannot recommend Fiona highly enough, she went above and beyond to help me pass and my fear of driving is long gone. I used the LDC workbook while learning and found it to be well structured. I particularly liked the diagrams showing clearly the situations in which certain actions should be taken. The diagrams for positioning on roundabouts was particularly helpful as this is something I'd struggled with. The question and answer sections also helped reinforce the knowledge I had learned during my lessons and for my theory test. 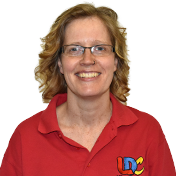 Overall, I would rate both Fiona and LDC highly and I am very grateful for the teaching and support material. I will be recommending Fiona to anyone thinking of learning to drive.